Trauma happens when your body suffers a wound from physical injury. When your body suffers multiple wounds or serious injuries that could result in death or serious disability, it is known as major trauma. Some examples of incidents that could lead to major trauma include: serious road traffic accidents, stab or gunshot wounds, falls from height, and serious head injuries. If you think you, or someone you know is suffering from major trauma you need to call 999 for an ambulance immediately. If we believe you are suffering from major trauma we will get to you as soon as possible. In some cases London’s Air Ambulance, staffed by a doctor and an experienced paramedic, will also be sent to you. If you are suffering from major trauma our staff will take you to a major trauma centre for specialist treatment, sometimes bypassing the nearest hospital. At a major trauma centre you will have access to senior, expert clinicians 24 hours a day. You will also have access to a full range of diagnostic equipment. 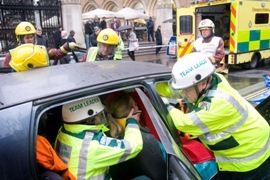 During 2010/11 an additional 58 patients in London with life-threatening injuries, such as amputations and gunshot wounds, survived because they were taken to a major trauma centre. Trauma happens when your body suffers from a physical injury, but it is not as serious as major trauma. Some examples of trauma include a minor head injury or a fractured wrist, ankle or hip. If you are suffering from trauma our staff will take you to your local trauma centre, which will most likely be your local A&E department. Your can read a number of real life trauma stories. These patients below suffered a serious accident and were taken to a major trauma centre in London. When a 17-tonne lorry ran over 37-year-old Robert Williamson twice, the injuries to his legs and pelvis were so severe he wondered if he would ever walk again. Daniel Gray, 21, suffered severe brain injuries in a car crash but is on the road to full recovery thanks to immediate care on scene and at the major trauma centre in St Mary’s Hospital. Priscilla Currie, 28, suffered serious injuries after her motorcycle collided with a car in Bloomsbury in November 2010. 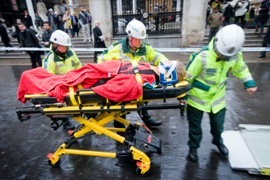 Almost 60 seriously injured patients in London who were expected to die are now alive because they were taken directly to a specialist centre by ambulance crews, according to figures released on 14 October 2011.